Intended as a means of adding ‘analogue mojo’, this device has been designed to integrate seamlessly into a DAW-based workflow. Louder Than Liftoff (LTLO) are a company that you may not be aware of unless you’ve come across their innovative 500-series ‘Chop Shop’ EQ or have discovered the modules made for the DIYRE Colour format — two of which were reviewed when we first looked at that platform, back in SOS December 2015. But they’re worth knowing about! LTLO’s founder, Brad McGowan, possesses an obvious love for sound and the recording process. This passion, along with his background in mechanical engineering in the aerospace industry, underpins his stated aim: to create tools that enable the musician or engineer to achieve inspiring results quickly and intuitively. 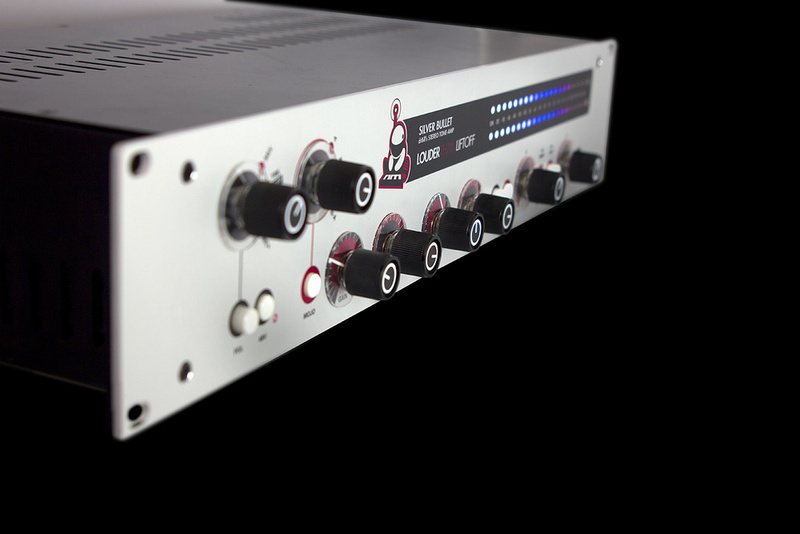 The Silver Bullet drBill’s Stereo Tone Amp, to give the product its full-length title, is LTLO’s first 19-inch rackmount device. It was designed by McGowan in close collaboration with industry veteran, musician, composer, producer and studio engineer William (Bill) Pearson, whose achievements include a Grammy award and writing additional music for the Academy Award-winning documentary Twin Towers. Since werewolves are conspicuous by their absence (even in London), perhaps the simplest way to think of the Silver Bullet (from hereon SB) is as a two-channel analogue stereo mixing console that’s designed to sit at the centre of a hybrid analogue/DAW recording and mixing system. Functionally, the SB is split into three sections — a stereo microphone preamplifier; its ‘Mojo’ stage, made up of two stereo gain blocks (the A and N Tone Amps), each with gain and output level controls; and a two-band Baxandall EQ with additional, switchable options. On the rear panel, you’ll find three sets of balanced stereo inputs (labelled Mic, Track and Mix) and two electronically balanced stereo outputs (Mix and Track). The Mic input’s default routing is to the Track outputs via the Mojo Tone Amps and EQ, but an internal jumper can be set to divert to the Mix output when, for example, the SB is being used to process the output of a passive analogue summing mixer or other hardware that requires more gain to be added to its output. The Track inputs handle signals from a DAW’s D-A converter, external preamplifiers, mixing console outputs or insert sends, synths and so forth, and routes to the Track outputs via both processing sections when the SB is in Track mode. The Mix inputs are designed to accept either the stereo output of a mixing console, the send of a stereo master-bus analogue insert, or the stereo analogue output of a DAW D-A, and are routed to the Mix output via both sections of processing when the SB is in Mix mode. Unbalanced inserts on TRS quarter-inch jack sockets sit between the Mojo and EQ sections, allowing external processors to be patched in as and when required, as well as offering the options of either directly accessing the SB’s Baxandall EQ, or routing the output of the Mojo section elsewhere. However, these inserts are not necessarily active in all modes, as another internal jumper (J14) selects between the three insert modes: (a) inserts bypassed during tracking; (b) inserts bypassed during tracking and when either of the two mic modes are active; and (c) inserts active in all modes. Conceptually, the first mode suits your workflow if you want to have the insert active when mixing, when using the SB as a mic preamp or when adding gain to a passive summing mixer. The second is geared towards mixing, where you want to insert a compressor on the mix bus but to bypass it when, for example, comping a track or doing a quick overdub. The third ‘active-in-all-modes’ option means that, for instance, you could also wire the SB’s inserts through a patchbay, allowing you to access them whenever you want to, or to keep your favourite outboard permanently in the insert loop and switch those units in or out using their individual (preferably hard) bypass switches. On the output side, the Track outputs can be connected to a DAW’s A-D converter, mixing console inputs or insert loop returns when tracking, whilst the Mix outputs can be sent to a DAW A-D, a two-track recorder or a console’s master-bus insert return when mixing. Completing the rear-panel population, a multi-way input connector accepts the highly filtered and regulated ±21V DC and 52V DC outputs of the SB’s chunky external switch-mode, universal voltage power supply. First up on the top left of the front panel is the selector switch that accesses the four operational modes: MIX, TRK/BYP (Track/Bypass), MIC and MIC+. MIX is fairly self-explanatory, in that it routes the Mix In to Mix Out via the Mojo (Tone Amps), insert points and EQ. The tracking side of TRK/BYP is similarly easy to comprehend: it routes Track In to Track Out via Mojo and EQ, with inserts active only if they have been set to be active in all modes. This mode also has a secondary function as a global, relay-switched hard bypass of the SB’s Mojo, insert and EQ sections for the Mix routing, since engaging TRK/BYP routes the Mix inputs directly to the Mix outputs, allowing you to switch instantly from a processed to an unprocessed mix and back. Mic and Mic+ follow the same routing and Mix hard-bypass scheme as the TRK/BYP mode, unless they’ve been routed via an internal jumper (J13) to the Mix output, in what LTLO call the Folcrom mode, which is a nod to the eponymous passive summing mixer from Roll Music Systems. Mic+ produces 24dB more gain than the Mic setting, a necessary option for ribbon and low-output dynamic microphones. The common-to-both-channels polarity and 48V phantom switches affect both microphone input modes. The ‘A’ and ‘N’ on the front panel refer to the two classic ’70s console emulations, which are implemented in different ‘Tone Amps’, and these can be auditioned and combined in various ways.The Mojo on/off switch and mode selector (labelled A, N, A>N and N>A) come next. From these initials it should be reasonably easy to work out which two famous 1970s consoles are being referenced in the twin Tone Amp gain blocks of the SB’s stereo microphone preamplifier. Should you need a clue, one block is equipped with LTLO’s API 2520-type Rogue 5 discrete op-amps and a pair of Cinemag transformers, whilst the other features custom American-made transformers based on a model originally manufactured by Marinair in the UK. Each Tone Amp has 41-position, detented rotary Gain and Output level controls, plus a blue ‘active status’ LED that also acts as a signal-level indicator, turning from an ever-brighter shade of pink to solid red as the gain level rises. The Tone Amps can be selected individually or cascaded, either as A>N or as N>A, the latter routing being indicated by the blue Swap LED that sits between the two control knob pairs. Gain in the Tone Amps is set so that setting minimum Gain and maximum Output — or any mirror-image control settings such as nine o’clock and three o’clock (or vice versa) — will give unity gain. The gain available in Mic mode through one Tone Amp ranges from +6 to +30 dB. Cascading the two Tone Amps can add up to another 24dB of gain, whilst switching to Mic+ lifts the maximum available gain from 54 to 78 dB. The final link in the signal chain, the two-band EQ, is a little more complex than the classic Baxandall design. A switch marked Tight, which precedes the Baxandall EQ section and acts independently of it, brings in a 12dB-per-octave high-pass filter at 20Hz, with a slight resonance (+0.6dB) at 40Hz that (subjectively) tightens up the bass, removing subsonic frequencies in order to increase low-frequency headroom. Engaging the Tone switch activates the EQ, turns on a blue status LED, and brings in a buffer with what Brad McGowan calls “some special discrete mojo-inducing circuitry”. Each EQ band has two frequency options, each with ±9dB of cut or boost and detented controls. The low-frequency (LF) band is inspired by the response curves of the vintage Pultec EQP-1A’s 30 and 60 Hz settings, and these correspond to the LF’s Sub and Bass switch positions respectively. The high-frequency (HF) section’s two options are Presence at 4kHz, whose response curves appear (judging by the graphs in the user manual) to start levelling out at around 40kHz, and Air, which looks as though its curves start to level out at around 60kHz. Following the EQ section, and acting independently of it, a Vintage switch brings in a 6dB-per-octave low-pass filter that acts on the extreme high frequencies (it has a corner frequency of 43kHz) in order to replicate the smooth and silky top-end character of vintage Neve consoles. The overall frequency response of the SB is flat from DC to well north of 100kHz, which is astounding! Of course, that’s without Mojo or EQ in the circuit — since these sections are intentionally designed to shape frequency response, distortion and phase, the situation is more than a little different when these are active. Finally, we come to the metering. The Mojo and EQ status/level indicator LEDs I’ve already mentioned, but these aren’t exactly precision instruments — that said, they do have an interesting decay time, with the change back from red to pink happening reasonably quickly, whilst the change from pink back to blue seems excruciatingly slow — that's because they serve as a distortion meter, and as such require a slow integration time. In addition, a good chunk of the front panel is occupied by a large stereo LED ladder meter, scaled in 2dB steps from -20 to +16 dB, and calibrated so that 0VU equals +4dBU. The ladder colours change from white at -20dB, to blue at -6dB, and to pink at +6dB, giving the user an extremely clear view of the output level. This stereo meter has modified PPM ballistics that not only display the average levels you’d expect to see, but also respond fast enough to reflect fast transient peaks. This meter always displays the output of the active mode after all processing, so that, for example, switching to TRK/BYP while monitoring the Mix output will result in the meter display disappearing if there is no signal entering the Track inputs. The Silver Bullet has been designed to suit a hybrid digital/analogue, recording/mixing workflow, in which it can be used to add a dose of its mojo-enhancing mix of desirable distortion, tailored frequency response and phase manipulation to a finished, digital ‘in-the-box’ mix. Alternatively, as happened naturally in the heyday of the vintage consoles on which the SB is based, it can be used to add a little mojo every time a track passes through it, so that the cumulative build up of said mojo is more ‘organic’, rather than adding a relatively large amount of processing to a final ITB mix. In a recording situation, the manual (and Dr Bill) both suggest that you first configure the SB’s Mix inputs and outputs either as an analogue insert on your DAW’s stereo mix bus or across the analogue stereo mix outputs of your audio interface, with a loop back into your DAW as though you were about to record a final mix track. With the Track outputs routed to a suitable pair of inputs on your audio interface, you can record through the SB’s Track or Mic inputs using the appropriate mode. Since you’re monitoring the DAW’s stereo mix bus, and the SB’s Mix inputs are hard-routed to its Mix outputs in Track and Mic/Mic+ modes, you’ll hear no processing on your existing tracks but you will hear the effect of the SB on the tracks being recorded. The same setup’s Mix input/output arrangement will handle the processing both of a final ITB mix or — inserted into or across the stereo bus of an analogue mixer — the processing of a final analogue mix. The Silver Bullet is intended as a versatile centrepiece in modern recording, mixing and mastering workflows — hence the profusion of analogue I/O on the rear. In its primary role of adding mojo to an otherwise digital mix, the Silver Bullet is an impressive performer. Set up for a clean sound, its API-style A Tone Amp is more than capable of delivering an open, clear top end and a precise, well delineated and (to my ears) slightly forward mid-range alongside a well-extended, fast, tight and punchy low end. As a result, the A Tone Amp produces a wide, clearly defined stereo soundfield. By comparison, the Neve-inspired N Tone Amp, whilst maintaining that sense of stereo width and definition, is warmer and fatter in the bass end, feels slightly fuller and more laid-back in the mid-range and somewhat smoother and sweeter in the treble. Cranking up the Gain control rewards you with increasing amounts of harmonic saturation in both preamps. The amount of gain on tap means that going from the slight thickening that seems to bring everything more together, through crunch and into distortion, is only too easy — knowing when to stop becomes key. What really does help, especially when cascading the two Tone Amps for maximum mojo, is the gain staging that gives unity gain when a Tone Amp’s controls are mirror-images of each other. For example, the ability to drive the A Tone Amp relatively hard, to saturate transients whilst keeping its output at unity gain, meant I could retain the flexibility to use the N section either to polish and sweeten the sound, or to drive it hard to inject more weight, warmth and colour into the mix. Although the Tone Amps have great mojo and are superb in themselves, the Silver Bullet’s EQ section is, to me, the star of the show. The independent Tight and Vintage filters are so well-voiced that I found myself tending just to leave them in circuit. The SB’s response is so wide and flat that a little trimming of the high and low frequencies usually gave me a basic sound that I was very happy with. Switching in the Baxandall EQ with both frequency bands set flat does perceptibly change the sound, adding what feels like more space and depth to proceedings and providing yet another reason to leave a Silver Bullet in circuit when recording, mixing or mastering. In both Sub and Bass modes the EQ’s Pultec-inspired low-frequency performance allowed me to add considerable weight and depth without losing definition in the low mid-range or, especially with the Tight filter in circuit, to pull back low bass frequencies without feeling that I’d lost too much weight in the process. At higher frequencies, the HF response with the 4kHz Presence switch engaged helped my venerable Bang & Olufsen stereo ribbon mic to sound more open and detailed when recording, whilst the Air setting just opens up the top end of a track in a highly addictive manner. On the recording front, the sound and audio quality of the Silver Bullet’s stereo mic preamplifiers are absolutely excellent. Clean, detailed and transparent until you start adding Mojo and EQ, their performance alone might well justify buying a Silver Bullet, even if all you needed was a new mic pre. As someone who started out recording on a Neve/Studer combination, the Silver Bullet has significant and unique sonic strengths that I personally find extremely attractive. The results of running individual tracks or mixes through the Silver Bullet are impressive, provided you’re into the character and sound quality of vintage 1970s analogue consoles. Even if your tastes are more modern and you’re not looking for that particular sonic profile, the effect of simply having a Silver Bullet in circuit with the Mojo section bypassed, EQ active but flat and Tight and Air filters engaged could well seduce you. Perhaps most importantly, the Silver Bullet has been deliberately designed from the ground up to integrate seamlessly into a hybrid workflow, with its analogue circuitry bringing a vintage vibe to tracks, subgroups and the final mix whilst otherwise you work entirely in the box. In theory, investing in a Silver Bullet or two (or even more) to record, subgroup and mix through could remove any need for an analogue console, an analogue summing mixer or multiple instances of emulation plug-ins. And while we don’t all have the means to lavish huge sums on this sort of processing, the Silver Bullet actually comes at a rather attractive price, considering the quality and character that’s on offer. And for all those reasons I heartily recommend that you audition a Silver Bullet. I can’t think of any exact equivalent from other manufacturers, although something like the Funky Junk Industries 3202 MkII Summing Mixer could be well worth considering if all you want is to add mojo to a mix. Just to complicate matters for you, though, LTLO’s alter ego, the Void Corp, offers a limited-edition, black-liveried version of the Silver Bullet. Wonderful vintage-voiced (1970s API and Neve) gain stages. Equally at home in tracking, subgrouping, mixing and mastering situations. One will never be enough and two will never be too many! 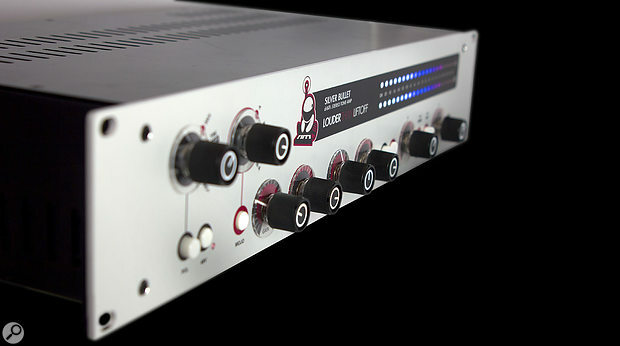 An attractively priced, stereo combination of a high-quality microphone preamplifier, two vintage-voiced channel amplifiers, a two-band EQ and an internal routing schema whose simplicity belies its great sonic subtlety, the Silver Bullet is designed to occupy a unique niche as the centrepiece of a hybrid analogue/digital workflow in home, project and professional recording studios. $1999 plus shipping, duty and VAT (around £1875 plus shipping when going to press). Louder Than Liftoff +1 408 686 9585.